Hey kiddos. I’m sorry about the lack of new verbiage around here lately, but one of us is traveling (not me) and the other has been severely overworked (sadly, I must raise my hand). If you’re interested in paying me a living wage to drive around, take pictures of malls, and research their history, please submit your proposals using the comment feature. Please, no recruiters. No phone calls about this job. EOE. 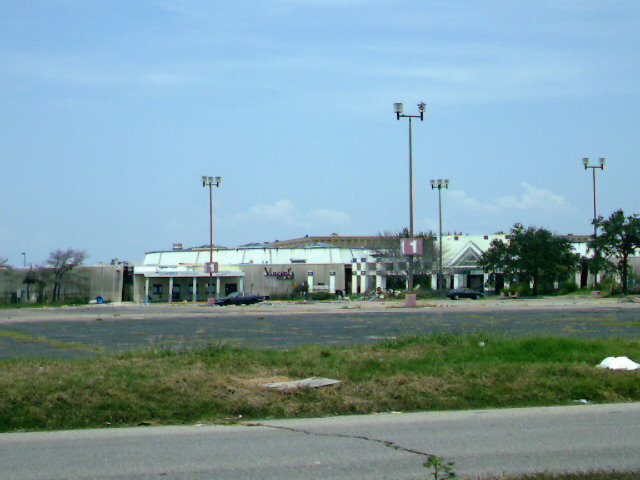 Lake Forest Plaza (The Plaza) in New Orleans was opened in 1974 in the rapidly growing east side of town. The original anchors were Maison Blanche, D.H. Holmes, and Sears. The mall featured a diamond shape design and huge ceilings. In 1985 a Mervyn’s anchor was added. This mall also featured the only ice-skating rink in the New Orleans area. In the 1970’s and early 1980’s this mall rivaled the other two powerhouse malls in the area Lakeside and Oakwood. Then the oil bust happened in 1986 and the New Orleans area started to decline especially in New Orleans east where The Plaza is located. In 1989 the mall completed a renovation that was expected to freshen up the dark design inside of the mall. This actually hurt sales even more because they removed the ice rink and installed a food court. Crime in New Orleans east was also getting out of hand, further decreasing traffic. D.H. Holmes also became Dillard’s when the company sold out in 1989. In 1993 Sears closed up their location at the mall. 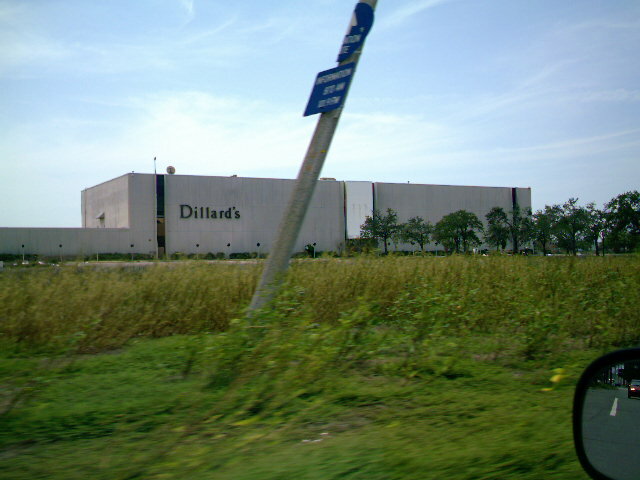 By 1996 the mall was in a deep decline and Dillard’s closed without any warning. The same week Mervyn’s started a closing sale despite pleas from the mayor Marc Morial to stay. In 1999 Maison Blanche became Dillard’s after they sold out and by this time the mall was barely 50% occupied. Service Merchandise next to The Plaza closed as well in 1999. A new cinema was opened outside the mall in 2003 called The Grand. The mall struggled on losing most of the corporate chains and by 2005 only about 30 inline stores remained. 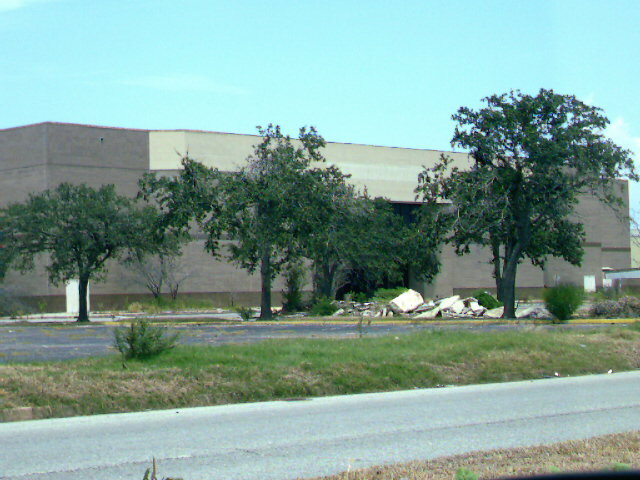 Hurricane Katrina in 2005 inundated the property with 7 feet of standing water for weeks and ruined the entire mall. 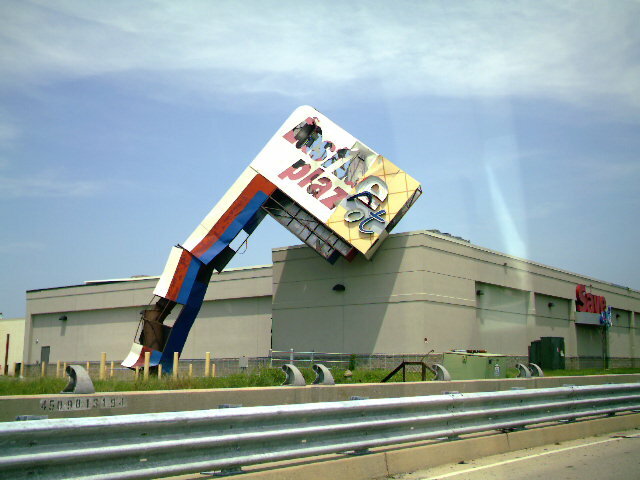 The mall also sustained a good bit of wind damage. One year after the hurricane the property is being partially demolished to make way for a new Lowe’s. The plan is to demolish the entire mall and redevelop the property as a mixed use development with the Lowe’s and The Grand Cinema as anchors. 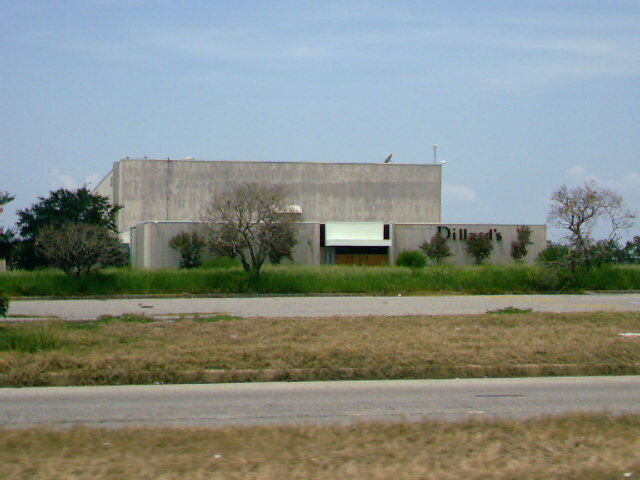 Dillard’s has not announced if it will ever return to the site, and with only 20% of the pre-Katrina population back in the area Dillard’s would not want to return anytime soon. This mall was on its way out before Katrina and demolition is the only current solution to bring this property back to life. The redevelopment of The Plaza will be interesting to see and much needed to a community in need of businesses. To the shooter: did you really fear to get out of the car to get some close and personals? I’d typically shy from shooting at vacant malls especially given the area, who knows who might be lurking around or inside. Good shots for carside though, kudos. This is when the national guard was heavily patrolling New Orleans and arresting trespassers so I did not want to take any chances. I have a better digital camera now and I will be going back around mardi gras time so I will get some updates. 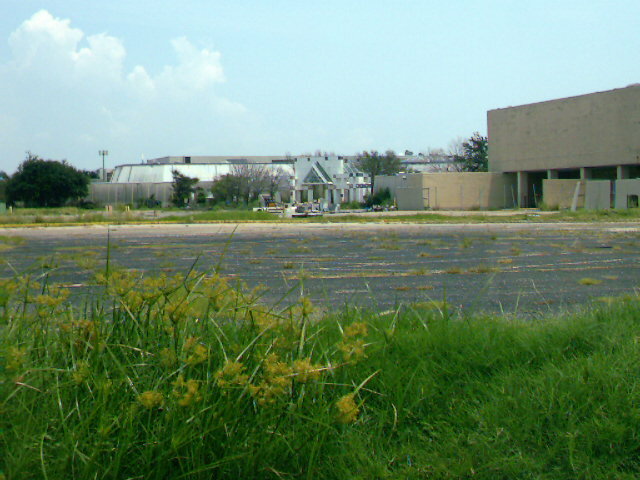 The abandoned Dillards surrounding by a lot full of waist-high, overgrown vegetation seems rather surreal. I wouldn’t mind having that Dillards exterior signage. Wow so, JohnE, when you visited was the entire city abandoned? My god, that must’ve been horrifying. That Dillard’s did a roaring business despite its demographics, though the rest of the mall was a different story. Even then you could see a lot of rotting signage (my favorite was the “Plaza Puts you First” premier lot which was long out of service). The ceiling was extremely high (due I believe to the unique signage when the mall first opened) , and while the mall was fairly pleasant (lots of filtered skylights) , the lighting was putrid (and from the looks of it, it came from the 80’s renovation, but I could be wrong.) A lot of the fixtures looked like they were lifted from a ddumpy gas station, I kid you not. It was just this sickly bluish mercury-vapor glow that made the place look excessively dated and very downscale. The mall’s “chinese throwing star” layout was pretty clever. Could we see these pics? Could you get in touch w/ the admin and have them put up on this page? When I took these pictures the population of the New Orleans East area was about 2,000 down from about 75,000 before the storm. It is very surreal driving around and only passing about one or two cars every 5 min or so when this area was notorious for traffic before the storm. Very eerie indeed. It must have been like seeing a city after the war. Dead and empty, like zombies are hiding in the shadows. the mall was literally swimming after the flooding. something like 200 people were in E. NO trying to get back their lives. 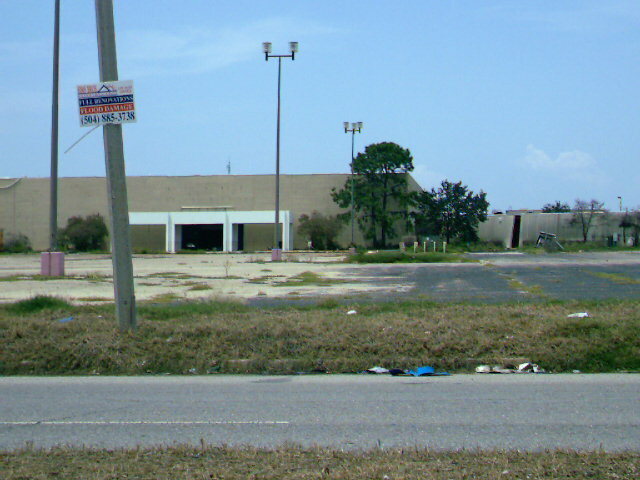 NO and slidell have both been trying to get something new over there for a LONG time…..the slidell factory outlets have been dead for over 12 years now at least, and part of the problem was this mall. “The Plaza” was once the most powerful/popular/highest grossing mall in LA. In its heydey it accounted for a full 25% of all sales tax collected in Orleans Parish!!! It opened in 1974 and for about a dozen years there were tenant waiting lists. It’s original anchors were DH Holmes, MaisonBlanche, Sears and a 4 screen Plaza Cinema operated by Gulf States Theatres. A Mervyns was added in about 1985. This mall had EVERYTHING…..ice skating rink in the center, flanked by a food court, a huge in mall McDonalds, the very first Chick-Fil-A in all of LA, a huge Walgreens with a restaurant, Sizzler, Morrisons, Swiss Colony, Space Port arcade, Leonard Krower, the first Gap in LA, Porter Stevens, Rubensteins, Imperial Shoes, Bakers, 5-7-9, GNC, a really cool Farrells Ice Cream Parlor Restaurant that was packed all the time, and tons of other local and national chain stores. It was the largest mall in LA, at over one million square feet of space. For many it was the absolute biggest, best entertainment venue in the area. Way ahead of its time combining recreation in the form of the ice skating rink, tons of dining options, including many table service restaurants in addition to the food court, great shopping (well over 100 stores), and of course entertainment in the form of the cinemas. It had a very unique clover leaf design (not diamone or otherwise as some mentioned)….it was mad of 4 wings, each spanning off to an anchor store or the cinema, with the ice rink/food court in the middle. Each wing had a unique name (santa clara mall, santa rosa mall, santa ana mall, santa maria mall, with the middle sections being called the fiesta plaza mall. It’s obvious homage to Spanish heritage was reflected in the use of dark colored tiling all over, walls, floors, etc. A unique feature were the verical store signs and the overabundance of skylights and real trees and plants all over the interior. It was truly a beautiful building that held up quite well design wise through the years. It underwent a total renovation in the late 80’s that really brightened things up and used a white and teal color scheme, but it also removed the ice-rink which was a blow to its popularity. As the economy plummeted it’s New Orleans East neighborhood into the doldrums, so went the Plaza. The area became a haven for huge Section 8 housing slums, crime and theft rose, Sears closed, then Holmes, then Mervyns, then the cinema, etc, etc. etc. Eventually Katrina hit and of course she finished the job. Pleasantly the area is being redeveloped incorporating the ideas of master urban planner Duany/Plater/Zybeck……other than the Lowes store (which will do tremendous business, considering it’s nearby Elysian Fields Store is the top performer in the entire chain!!!) no other anchors have been announced, although they hint at an electronics store, hotel, housing, likely a Kohls, and a few restaurants and the reopening of the Grand Stadium Cinema 16 which was added in early 2000. Regardless what they do to the site, the glory days of family fun will never be duplicated by what the Lake Forest Plaza Shopping Center originally was. Doesnt mean it wont be successful though!!! 🙂 rest in peace Lake Forest Plaza!!!!!! Lake Forest Plaza Mall will be gone soon for sure as mentioned above. I will be there to take pics later this month to update this post. Demolition officially started on Feb 06 2007 so hopefully there will be several open areas to peek into. On my mardi gras visit I had a chance to go see the mall. I was sad to see it has been completely demolished with the exception of the anchors. Only 10 days after the start of demolition it is already gone. I was not able to take stills because my digital camera is on the blink. My videocamera was performing well so I have a few minutes of the mall demolition footage and we got as close as the fences would let us as well as some 1996, 2005 and 2006 footage pre-demolition. I will be uploading those soon so anyone interested can shoot me an e-mail at espiau2851@yahoo.com. hello, can you please tell me if you can ;what ever happened to the fashion store called the carousel that was in the lake forest plaza in the 80’s? I remember the store very well and some of the other stores like camelot music and farrels ice cream parlor. there use to be one over in slidell as well but they closed down as well,oh one more thing if you have any information on farrels that would be great as well. Thank you so much. New Orleans is DEAD, and basically so is the rest of the State of Louisiana. I hardly think there will be enough citizens to support a big box strip center since there are still 2 functioning malls there. Its a very sad situation but true. I left Louisiana in 1991 and would never return to a state with such horrible government, low wages, taxed food, state income tax, and certainly not enough jobs to go around. Louisiana is not dead! New Orleans is severely wounded, but it will heal. Down, but not out. Baton Rouge is thriving. Over-populated at the moment, but thriving. New Orleans is far from dead. With all of the demolition and remodeling going on the city will be a new place in 5-10 years. Several millions of dollars are being spent to build condos in the CBD and Jefferson Parish. Update on the plaza, the entire mall has been demolished except for the old DIllard’s/Maison Blanche anchor. For some reason they have pulled the signs off but not even gutted it yet. 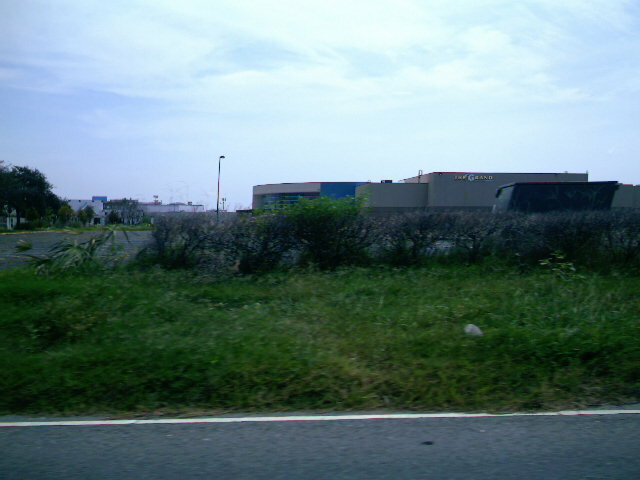 According to the times picayune Lowes will begin construction in June with the entire plaza site completed in 2008. The new development is called the renaissance town center and will be a typical lifestyle center. The Eastlake shopping center across the street has been demolished except for the furniture store anchor that is open again. Sam’s is still stripped down and Wal-mart has not been touched since the storm except for the removal of the signs and the boarded up windows. Surprisingly 37% of the pre-Katrina population has returned to the east and 50% of them have come back in the past 6 months. With these figures I believe the town center will do great and it is the only big center in the east that is coming back so far. More updates as I recieve them. I forgot to mention the grand cinema on the outlot is planned to be a part of the town center. No renovations have begun yet though. How can anyone say Louisiana is dead if you don’t live here. I know first hand that Baton Rouge is thriving(you should see the boom in the retail sector in the whole BR metro area). You would never know a huge storm hit most of Metairie/Kenner/Jefferson. Other major cities like Lafayette and Shreveport are thriving in many sectors, including retail. I haved lived in south Louisiana my whole life as well as many generations of my family. There are problems here, but they are some of the same problems that exist in other states. The people here are good and deserve the best of everything, including shopping centers. This website is about the history of retail in the USA. And this posting is about The Plaza Mall in New Orleans, It is not a place bash Louisiana and New Orleans again! There are plenty other outlets that this can be done. The updates from John E in the previous post are accurate. And although there may never be a Plaza at Lake Forest like there once was, there will be a development of retail/office/residential in this part of New Orleans. And it will be successful because the people of New Orleans and Louisiana want a successful city and a first class shopping complex. And they deserve it! How ignorant to say that New Orleans is dead and then to admit that you haven’t lived here since 1991??? The only thing dead is your brain activity. When I was a kid, I lived walking distance fom the Plaza. It was where I first learned to ice skate, where I went on my first date to the Cinema to see D.A.R.Y.L. (does anyone remember that, by the way? ), it was the place where I tried my first Orange Julius and an eggroll, and the place where me and my friends were endlessly chased by “Pitts” (anyone remember that?). It was the place where I got into my first and last fist fight and purchased my 1st album- Standing on the Beach by the Cure… My friends and I camped out @ MB’s so we would we be the first in line to purchase Cure tickets. It’s completely demolished now, and although today I would never be caught dead in a mall, the Plaza will forever live in my memory, very fond ones at that. Yes, I remember the plaza very well. It was one of the first places in the East that I could score crack. I use to go to the McDonalds and meet my boy Cabbie in the restroom. His brother was the manager and he got cabbie a job to -play off all the drug sales. Jamie couldn’t have said this better. That is why when I see even the smaller ‘community malls’, such as the one I did my first write-up for this site (Edgewater Mall @ Manitowoc WI) whitering away in a slow slide towards a possible death, it does dishearten me a little. Sure, the concept of buildings like this was a trial done in the late 1970s into the early ’80s during the huge energy crisis (people didn’t travel as far due to high fuel prices, so I believe that’s why this mall concept was put into play for small cities. Take two big-name boxes, throw in well-known national tenants, usually a dozen or two-dozen in an enclosed hallway, and there you go), that ultimately failed. In their heydays, that little mall (Insert any name, really) with a mere 15-20 shops and two big-box anchors at either end, served as the community gathering space for people to not only do business (what malls are intended for in the world of commerce) but also to make memories, hear the talk of the town, participate in various events. Not-for-profit organizations could get exposure they otherwise wouldn’t have in a public venue, and for-profit businesses (Yes, as much as we sometimes despise the ‘mom-n-pop’ upstart businesses and services that usually signify the decline of a mall) can get exposure with the foot traffic that walks the halls. Big boxes and ‘lifestyle’ concepts are the very definition of that. Of course, that’s just my opinion, and I’m probably being biased. Thanks Matt from WI, you elaborated perfectly the thoughts I was trying to convey. I did not mention on my previous post that on my recent Memorial Day weekend trip to Florida, I passed through New Orleans East and the pile of rubble that was once The Plaza. I just sighed and gasped at the sight. And just could not believe that pile of concrete and glass was once a class A shopping center. And then driving to the next exit on I-10, Bullard Ave, was another depressing sight. The following stores, all open the night the storm hit, were boarded up and closed: Pep Boys, Toys R Us, Circuit City, Save-O-Center and a shopping center anchored by Big Lots. The funny thing was, right in front of all of this was a brand new IHOP, and of course the Home Depot on Bullard was open. And as John E had mentioned before, on Read Blvd, across from the The Plaza rubble, was another pile of rubble, the East Lake Plaza Shopping Center, as well as the boarded up Wal Mart and the gutted out Sam’s Club next to it. And of course many of the appartment buildings that lie along I-10 through NO East were gutted out and still sitting there probably waiting to get demolished. But it was not as dead as it seemed, there were some appartment buildings that had signs saying,” newly renovated, move in now”, and most hotels and car dealerships that lined I-10 through NO east were opened too. But I would like to mention another thing that happened on my trip to Florida that just had to be gift from above. I was almost through Mississippi when I decided I was hungry and wanted to stop, so I finally did take the Gautier, MS exit because the sign said there was a McDonalds there. But when I got off the exit, the blue food exit sign had the arrow pointing right 2.5 miles to Mickey Ds. I was a little frustrated, thinking it would be right by the interstate exit, but decided, what the heck, just drive down there it isn’t that far. I was almost to US Hwy 90 and saw the most beautiful big monument sign that said “Singing River Mall”. I just could not believe it. I had seen this mall on the map and heard about it, but did not know this road was leading to it. I immediately turned right and and saw this beautiful old jewel of the south! I said to myself, I am going to go in, I have to see this mall. I really didin’t know much about the mall, but looking from the outside, it obviously was built in the late 70s or early 80’s and during the big smaller community mall boom that Matt had mentioned. Well needless to say it was everything I had expected. The decor throughout looked as if it was a typical mall that had probably been built in the the late 70’s or early 80’s, and had could have possibly been remodeled or updated sometime in the 90’s. And the back entrance that I entered had revealed that a former mall anchor was now an office for Northrup Grumman. 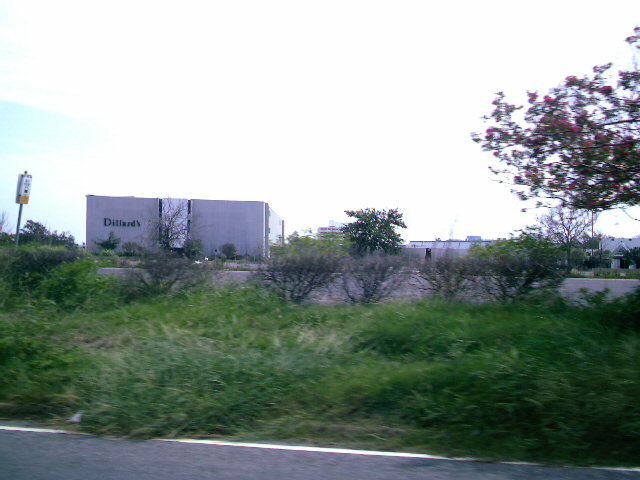 And driving around the mall I saw the other 3 anchors, Sears, JCPenney, and Belk(recently converted McRae’s). 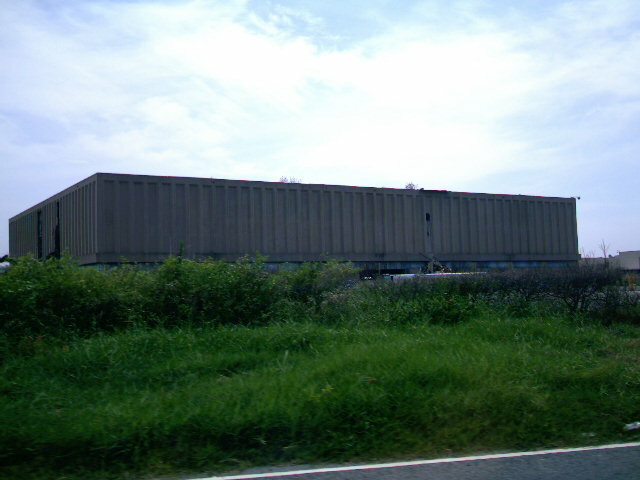 And I thought, here we go again, another “dead” or “dying” mall. That description was confirmed when I entered the mall through the Belk, I would say it was probably about 35 to 40% occupied. Another small community mall thrown by the waste side and forgotten. A google search found that Stirling Properties of Covington LA was the management of this mall, and also that is was built in 1980, was 563,751 square feet and was being redeveloped. From the looks of things, I suspect the only redevelopment for this mall will probably be the eventual demolition of the mall in a few years to make way for yet ANOTHER(sighs, rolls eyes) open air/lifestyle center built around the exisiting anchors. I know we are talking about The Plaza in this posting, but just thought I had to mention what I had seen in Gautier, Mississippi. Think about all the memories that we all know were probably made at Singing River Mall, now this place has a soul! Was anyone on the ice skating team the Dixie Darlings? I was on the Dixie Darlings…1987 until the rink closed in 1988. This mall didn’t have to die. When the ice rink was open, my mom would drive me from across town (Metairie) at least 3x a week. I spent all my money at the mall…I never shopped in Metairie. When they took out the ice rink, I decided Metairie’s malls would get all my business from then on. Jaime did you happen to get pics of that mall to post. Not many of those smaller malls have lasted since 2000 in the Louisiana and Mississippi gulf coast. No I did not take the time to take any pictures of Singing River Mall. The thought did cross my mind, but I was just kind of ready to get back on the road and did not take the time. I just kind of walked in, took a good look then walked out. I wish I would have. I am going to go back to Florida before the summers ends, and will definitely stop in Gautier and take pictures. Or I may just drive there one day just to see the mall and take pictures. Mississippi’s gulf coast is about 2 hours aways from where I live, now a hot spot for south Louisianians because of the casinos that line the coast. I don’t know anything about the mall’s history, but maybe you or someone else could supply that. It is certainly worthy of a spot on this website. I did the same thing when I went to Lafayette and stopped at the deadmall there. I was just looking for food and that mall did not have any food outlets left. I will do a write up on that mall in the future. Look for my write up on Northline mall that I have submitted to appear soon. I was not bashing New Orleans when I said it was dead! I have always loved New Orleans but let’s be real here. Rent is almost as high as New York City now, WRNO is no longer “The Rock of New Orleans” , B-97 is broadcasting via Jammin 105.9 in Austin, TX. I am assuming there are not enough DJ’s to fill in the empty spots. The Murder rate is worse than before Katrina, and the corrupt politics are still running the place. Louisiana is broke so that ridiculous state tax out of hand, and of course there are no real decent paying jobs, and the jobs that are available are more than likely not hiring. I wanted to move to Metairie from Lafayette back in 1988 and could not find decent paying work. I head to leave Louisiana altogether. I still love my home state, but you just cannot make a decent living there. I pray that all of this mess can be fixed, and the New Orleans area can thrive once more, but until they do something to attract business, stabalize tax, and rent, only the very wealthy can afford to live there. I am temporaily working in NOLA right now (I moved to Houston from NOLA in the early 90’s) . Last weekend on my way to Biloxi I drove by the site of the Plaza and only could shake my head in wonderment. When the Plaza opened in the mid 70’s it was a BIG event. Although the family homestead was(and still is) only 3/4 of a mile from Lakeside,my friends and I would go the 12 miles out to Lake Forest using our newly accquired drivers license and the Family Truckster. The Plaza had a lot of stores that we had only seen on trips to malls in other states. The Gap,Farrell’s Ice Cream,Oshman’s Sporting Goods AND most importantly,a Spencer Gifts,where I started to collect an extensive collection of blacklight posters,and flicker filament light bulbs! The ice skating rink was miniscule at best and I’m sure the carbon monixide levels went through the roof when the zamboni came out to resurface the ice,but to a 15 year old,the place was IT. Sometimes we would go and eat at Sizzler instead of burgers at Mc’Donald’s or Flame-N-Burger (a now defunct local chain). Back in the mid to late 70s . The area around the Plaza was thriving and Lake Forest was expanding rapidly. The downturn started in the early 80s and things plunged into decay rapidly. . .amazingly so. By the time I had returned from college in the early 80s one could see the difference. Before Katrina the surrounding area apartments had been section 8 or completely abandoned. Katrina merely dealt the final blow. Amazing indeed! As for the mall, I will visit the site and report on it to this site. Lake Forest Glory Days are indeed over; but a resurgence of a different type of mall is slated to take place. At presently only Lowe’s is on the site and the community’s population is approximately 60,000 strong. The area’s residents are trying to persuade other stores to open because there are many homeowners who would like to spend their discretionary income in this area in order to get New Orleans’ tax base at a rate that would entice people back to the Big Easy. The East has so much land and potential; it seems to need serious investors and a more cohesive group of people to make it the New Orleans East that it was in the 70’s. The tenacity of the people in that area is overwhelmingly optimistic. Let’s hope that New Orleans comes back bigger and better! The Dillard’s is finally gone and the Lowe’s is nearly complete. This area is still a huge work in progress that has just begun. The Walgreen’s on the outer side of the mall will be open soon and hopefully the design in the drawings becomes the look of the center. New Orleans East deserves this boost to attract more middle class families to the area and improve the local economy. 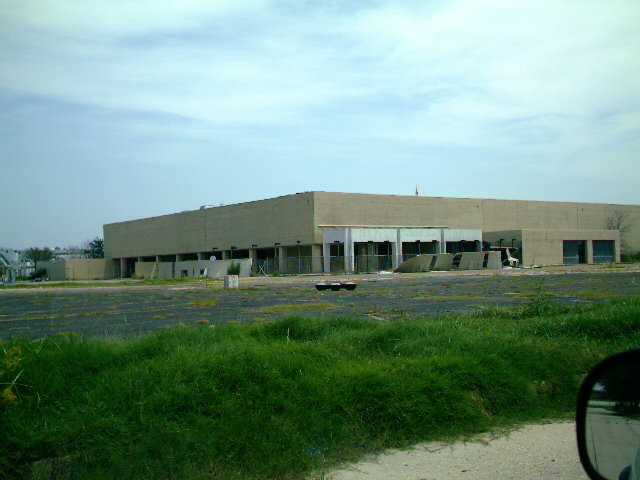 I have finally posted my videos of this mall during demolition at my new blog. Check it out at http://southernretail.blogspot.com/. Feel free to send submissions to my e-mail listed on my blog page. 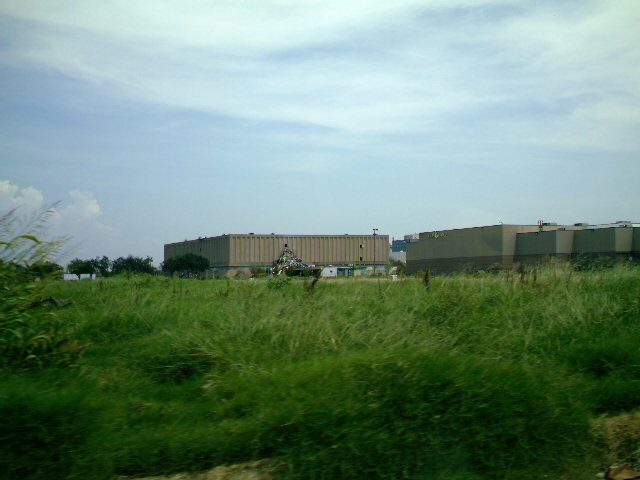 A portion of the Queen Latifah movie “Last Holiday” was filmed in the old Maison Blanche/Dillards pre-Katrina. It took me a minute to realize where they were, but the store looks just like it did until Katrina struck. Does anyone have any pictures of the layout of the place, like a mall map / directory or whatever? The design was very unique and I’d like to see it again to give context to my memories. Does anyone have any belle promenade mall info or pics? Please drop us a line at southernmalls@gmail.com. I have been thinking about my childhood and how wonderful I used to think this mall was. I was born in 1980 and lived in the East until 1991. I can remember the ice skating rink, orange julious, space port, a second arcade, and awesome mc donalds, Spencer’s and some other stuff. I remember the layout would confuse me. I’m searching for pictures, inside the mall, from the 1980s and early 1990s. Does anyone have some? Please leave a comment with some contact info or a link to the pictures. Thank you. I remember this mall. I was a student at UNO and had to donate plasma at the plasma center across the street from it (taking the Haynes bus…ack). I did this from 95-98 since my student loans wouldn’t allow me a meal plan on campus. I don’t know which was worse, riding that bus (which was a 20-25 minute ride that would otherwise be 10 min by car) or having to walk from the levee ALL THE WAY down to the plasma center. It is a long walk. Not really through the projects, but not snob hill either. My ex worked at the theater in 98. I remember her telling me all the problems they had with the locals inside, throwing things, breaking seats, screaming racism at every turn (no joke). I’d shoot the breeze in the arcade waiting for her to get off work on occasion, playing ms. pac-man. A year later I worked at Oakwood mall across the river (oak dale? I cant remember) at the arcade there. Again, taking the bus. Horrible way to travel if you’re a starving student. That mall was even worse than Lake Forest, but at least had two arcades (heh). I dont recall an ice skating rink however. What year was that? I look at those pictures with sad eyes. A very traumatic and impoverished time in my life (I now live in Canada–whole different scenario of misery up here). I hope I never have to donate plasma for food again. Every single time I went, I was the only white guy there among 15 others. It took me three hours to donate and I’d get 20 bucks and go blow it at taco bell across from the mall. I’d have maybe…ten bucks left for food the next couple of days. Funny, I was a lot thinner then due to all the walking I had to do (but at risk of getting shot). 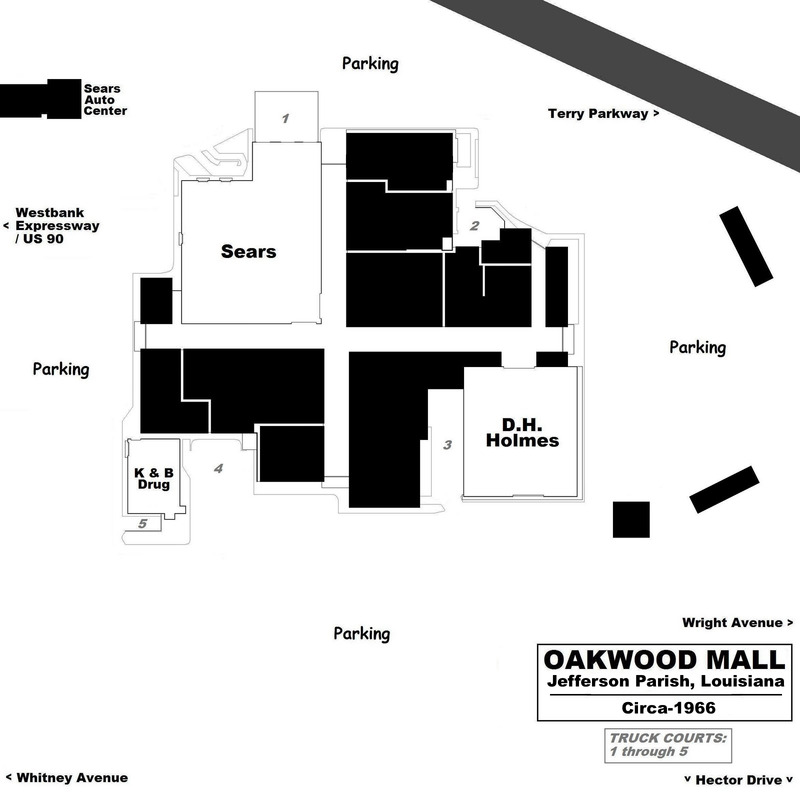 It would be great if someone would make a floor plan drawing of this mall…like the Mall Hall of Fame Blogspot. I would like to see the floorplan of this place and how everything was laid out. It would also be awesome if someone could come up with some pics from the inside when the mall was new. I’m very curious to see what it looked like. I bet it was awesome. I’ve been to Lakeside in Metairie back around 1999 and it wasn’t that great. Our Pecanland Mall in Monroe, LA was much better than Lakeside.